Every generation has had its own war – my grandparents had WWI, my folks had WWII. For me, the Vietnam War was the one my friends and schoolmates were called to fight. Now, we’re battling the War on Terrorism. We’ve been engaged for 15 years, and there’s no end in sight.This may be the modern war which carries on to the next generation. If you’re reading this blog, you probably remember exactly where you were on September 11, 2011 when you first heard about the planes hitting the World Trade Center. It’s one of those events that had such an enormous impact on our lives that it’s hard to remember life before that date. 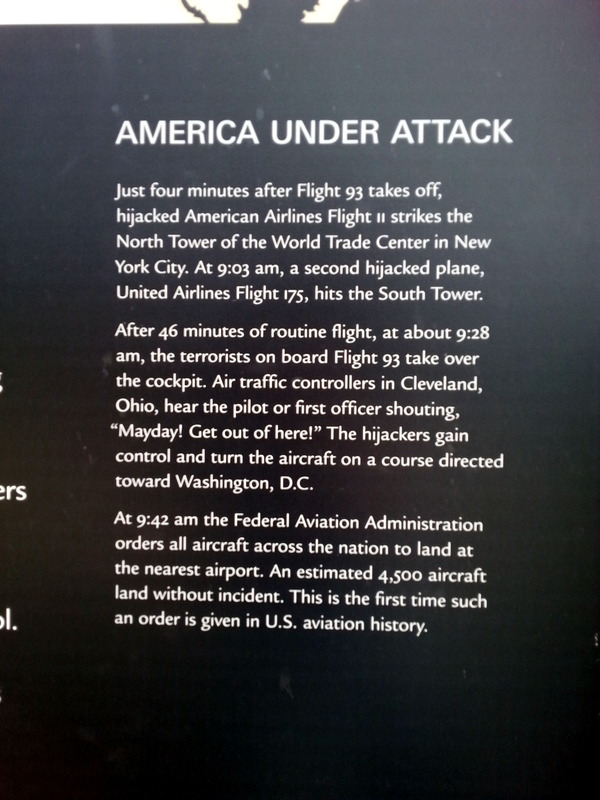 Flight 93 was unique that day, in that it was probably the only one of the hijacked planes in which all the passengers were likely certain of the outcome of the flight. Aware of the WTC crashes, the passengers gathered, and voted to fight the hijackers. 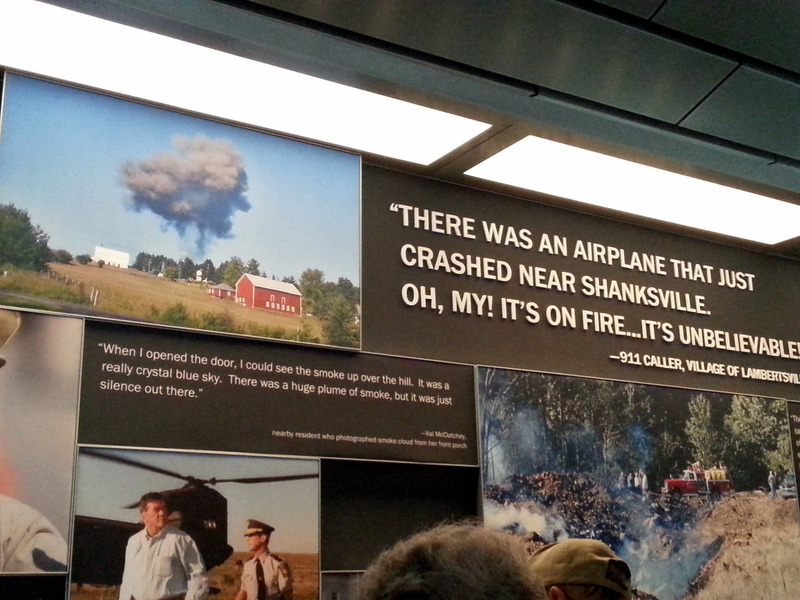 Twenty minutes flying time away from Washington DC, the passengers forced their way into the cockpit, fought the hijackers, resulting in the crash near Shanksville, PA. 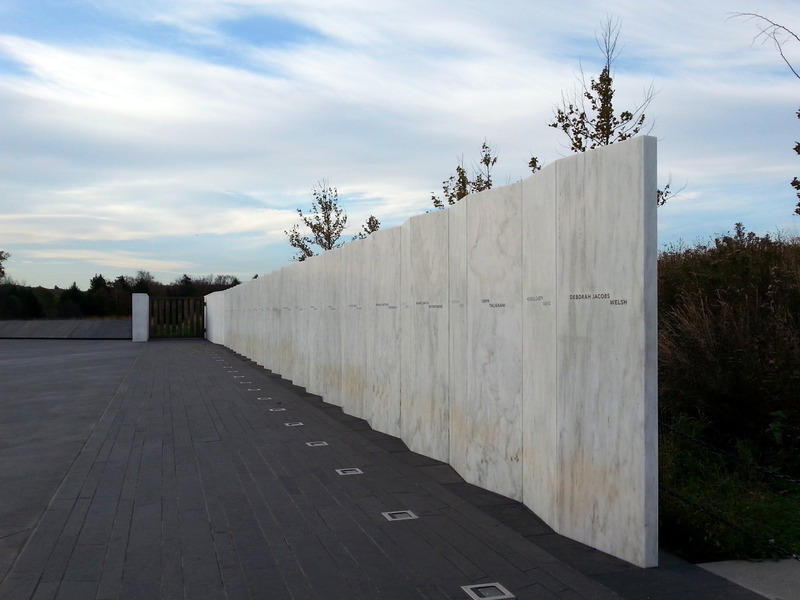 The Flight 93 Memorial Plaza has been open since September 11, 2011. It’s stunning in its simplicity, and in the symbolism of its design. Forty passengers and crew members perished that day. The names of these heroes are engraved on white marble slabs which form a wall, leading to a wooden gate with 40 facets. The gate guards a mowed path to a large sandstone boulder at the impact site. 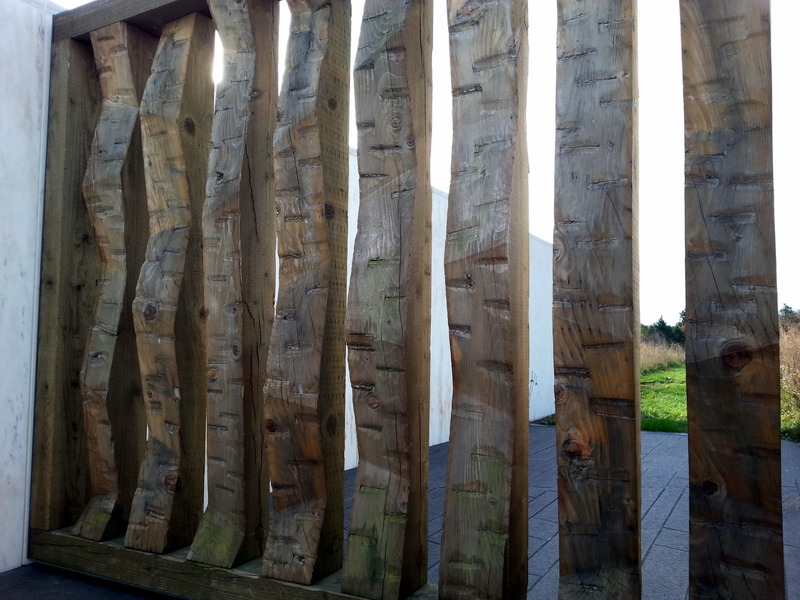 Forty faceted planes mark the heavy wooden beams of the gate. 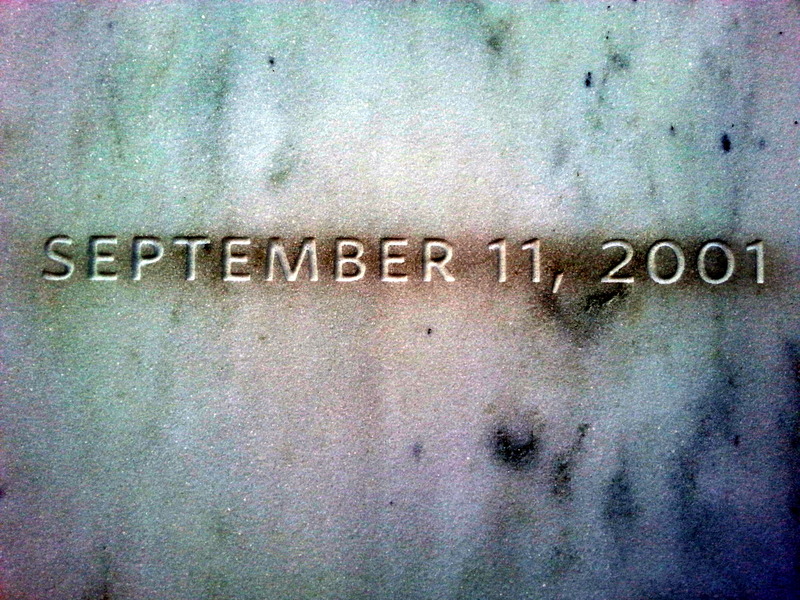 Already after four years, the white marble shows the discoloration of the many hands that have touched it, and the flowers and memorials that have lined its base. Benches resembling airline seats are scattered around, offering places for rest and reflection. Informational posters are there to remind us exactly what transpired at this site. Moving along, there’s a huge new tree grove – 40 sets of 40 trees each, set in a sweeping arc. It’s beautiful. As the trees mature, it will be spectacular. 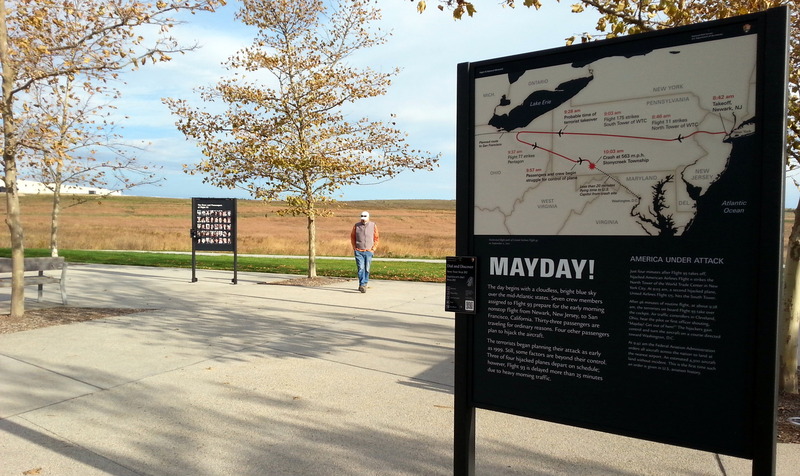 On September 11, 2015, a new Visitor Center was opened on site, featuring video and films of the newscasts from that awful day,artifacts, and intimate portraits of the forty passengers and crew who perished that day. Huge cement wings soar off the edges of the VC, echoing the path of the plane as it tumbled upside down into the ground. 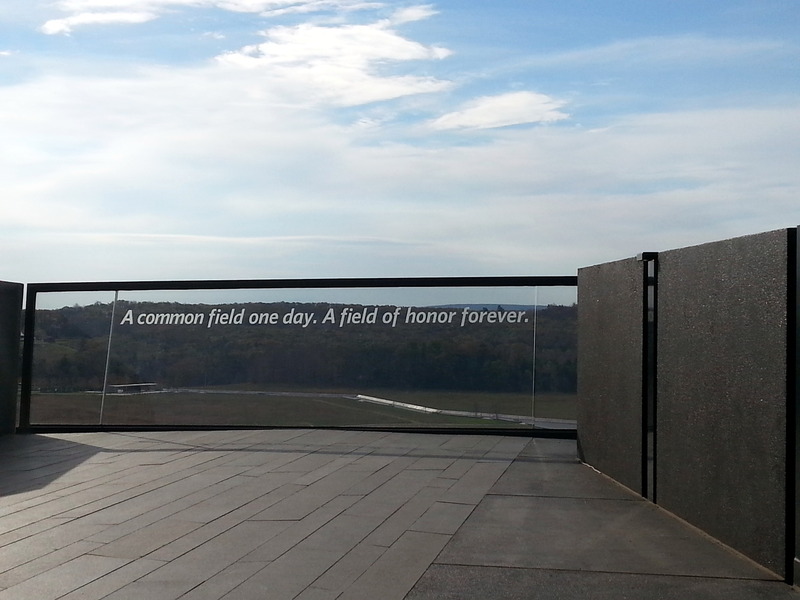 The photo above shows the view from the Visitor Center down toward the Memorial Plaza. The bright white in the distant center is the wall of names – the sandstone boulder denoting the impact site is beyond that. It was very difficult to see the films from 9/11 again. As the South Tower of the WTC collapsed, Peter Jennings is heard to whisper “My God”….A flood of memories rushes in. Tiny bits of twisted metal from the airplane are on display – hitting the ground at a 45 degree angle at more than 550mph, the plane disintegrated. The largest piece found was only about two windows wide, and perhaps six feet high. The voice cockpit voice recorder (or maybe the blackbox) was found nearly 25 feet below ground. Most striking, to me, was the absolute silence of all the visitors. 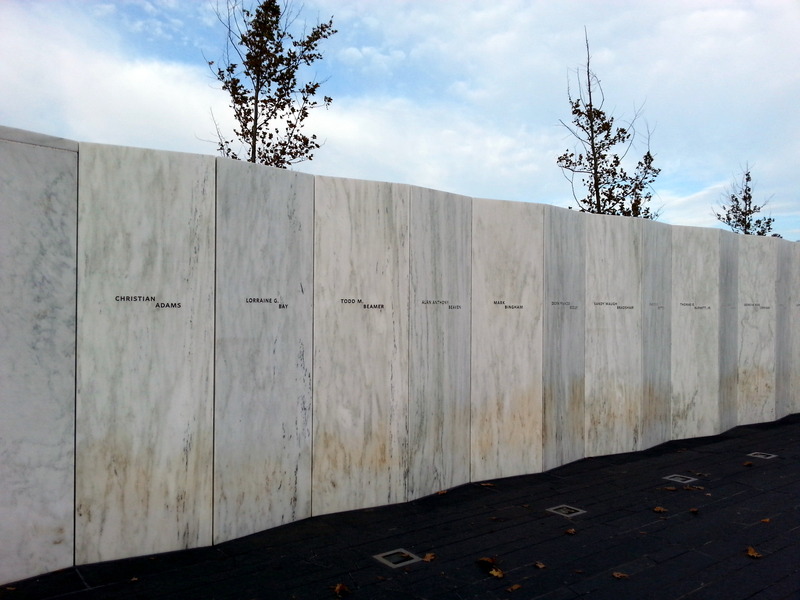 Nearly all of us had tears running down our faces, as we relived that day, and perhaps came to a new realization of the heroism of the passengers/crew of Flight 93. We all politely waited our turn for headsets, and exchanged slightly embarrassed glances due to our wet eyes and runny noses. I listened to recorded voice mail calls from some of the doomed passengers/crew to their loved ones. Scared voices expressing love. Overwhelming. 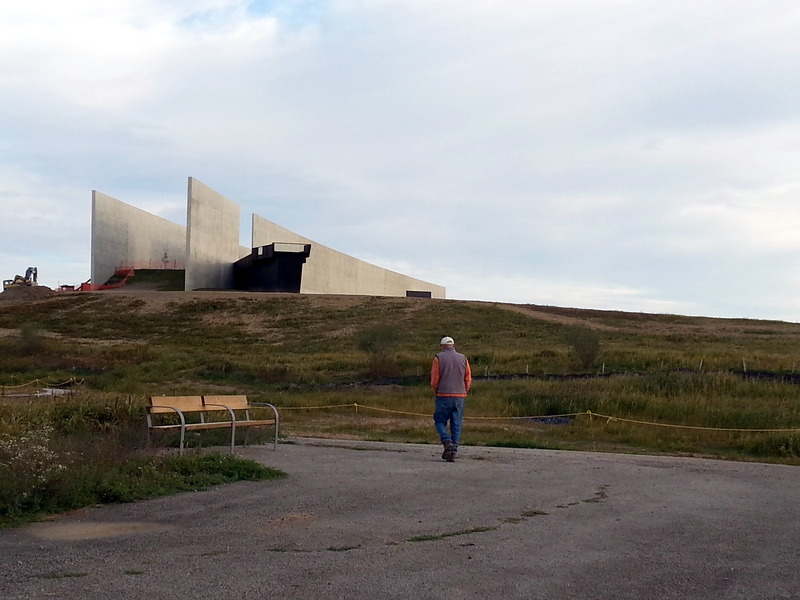 The design of the Memorial Plaza and Visitors’ Center is stark and beautiful. Every facet of the VC and the Plaza aligns the visitor with the path of the doomed plane. In 20 years, as the construction scars recede, it will be even more beautiful. This is a place which will stay in my thoughts for a long time to come. This entry was posted in camping, national parks, retirement, T@DA and tagged 9/11, Caledonia State Park, Flight 93, Flight 93 Memorial, national parks, Shanksville PA by Judy Crankshaw. Bookmark the permalink. Beautifully written, Judy. Words can’t express the feelings this creates in me. It’s still surreal and overwhelming. It’s a marvelous place to visit. Hope you can make the trip sometime. wow, what a powerful writeup. I see a book in your future. Thank you so much. No book, but thanks for the compliment! Awesome stuff Judy. So well done. Thanks, Michael. Hope you get a chance to visit. There’s lots to be taken away and remembered. Gordy and I went there two years ago not realizing how it would affect us. Just reading the names was so powerful and the silence was so amazing. Reading about your experience brought back the tears of that day. Sounds like another trip is in order. Hi, Barb. If I could only visit the Memorial Plaza, or the Visitor Center, I would choose the Plaza. But, there is no denying that the new VC really is an emotional wallop. Wow. I just can’t get it out of my mind right now. I have not visited this site yet, but as I read your entry I teared up. I can only imagine the feelings that come with a visit! This and the WTC memorial are on my list. Thanks for doing such a wonderful job of sharing with words and photos!! We also hope to see the WTC memorial one of these days. 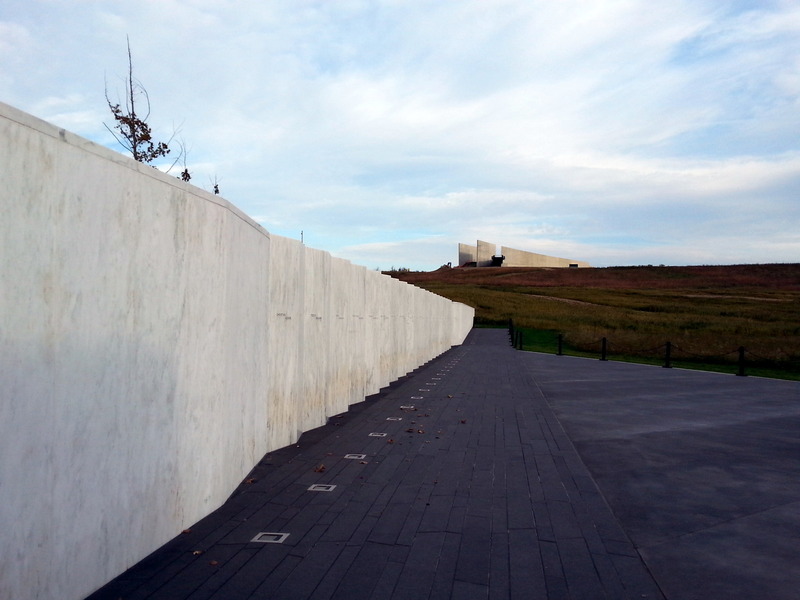 The scale of the Flight 93 memorial is small, but so intense, and so stark. It’s been a few days since we were there, and I still feel my throat closing, and my eyes watering. Hope you and Bob do get to visit. A very touching and fitting memorial to people who were willing to risk, then lose their own lives to save other Americans that they did’t know, the true definition of hero. Agree, Jerry. That these forty folks were able to pull this off is remarkable. They are heroes. 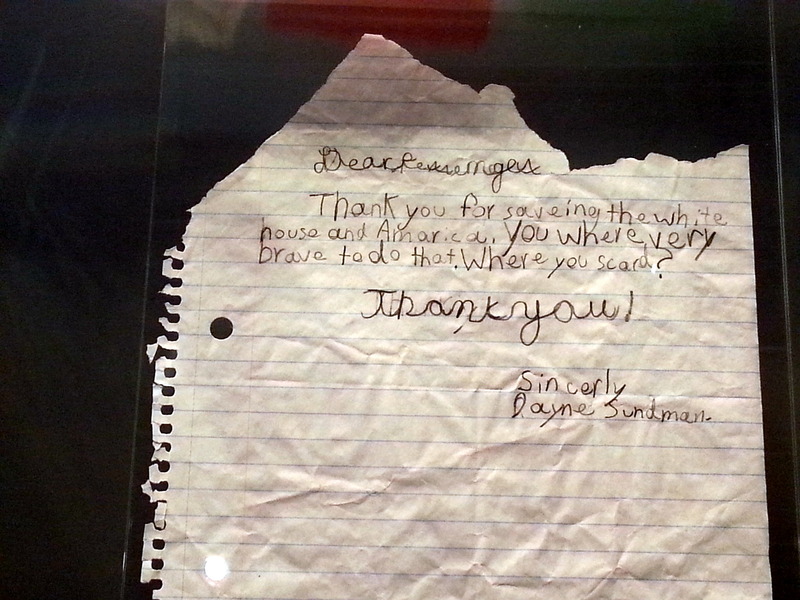 When Rose and I visited here in 2009, there was only a make-shift chicken-wire fence to hang mementos and notes on. There were also some NPS wooden benches with the 40 names inscribed. The memorial that you visited here was still in the planning stages. But everyone there had the same emotion as you describe. The silence of only the wind rushing through this field was something we’ll never forget. Hi Ken. I don’t think I’ve ever visited any memorial or monument that had this kind of impact on me, although the small Holocaust memorial in Boston came close. The architects and designers did a wonderful job of creating a beautiful, meaningful memorial. Hope you and Rose get a chance to go back.